Use a reliable torque wrench to tighten the parts listed to insure proper tightness without straining or distorting parts. These specifications are for clean and lightly lubricated threads only: dry or dirty threads produce increased friction which prevents accurate measurement of tightness. 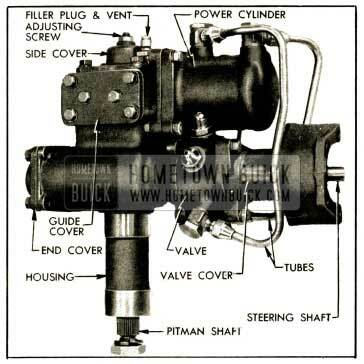 1952 Buick Power Steering, available as optional equipment on Series 70, consists of a conventional manually operated steering gear to which hydraulic power mechanism has been added. The hydraulic mechanism furnishes additional power to ASSIST the manual operation so that the turning effort required at steering wheel is greatly reduced. 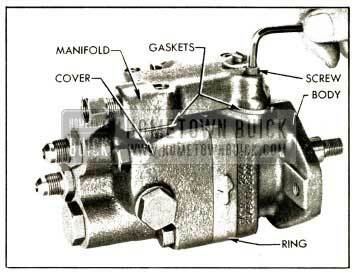 The engine drives the oil pump which furnishes hydraulic pressure. When the engine is not running, or when any part of the power mechanism is ‘inoperative, steering is entirely manual and requires approximately the same effort at the steering wheel as the manual gear used as standard equipment. With the engine running, steering is entirely manual under conditions which requires an effort of less than four pounds at the steering wheel rim. When a greater effort is required, the power mechanism operates to ASSIST in turning the front wheels. The effort then required at steering wheel rim is thereby limited to a maximum of approximately nine pounds for normal steering and parking conditions, compared to possibly fifty pounds with the standard manual gear. If some abnormal condition requires more work than the power mechanism can do, the driver must assist with increased effort at the steering wheel. The driver’s effort on the steering wheel is always proportional to the force necessary to turn the front wheels. When the effort on the wheel drops to less than four pounds as the turn is completed, power assistance ceases. When the wheel is released to recover from the turn, the front wheels may return to the straight ahead position in the usual manner without assistance or interference from the power mechanism. Through this conventional steering action the driver always has the “feel” of steering which is essential to confidence in controlling the direction of the car. 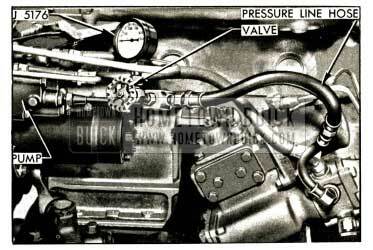 It should be noted that 1952 Buick power steering always follows the manual steering action. No steering action is obtained except through the manual guidance of the driver. 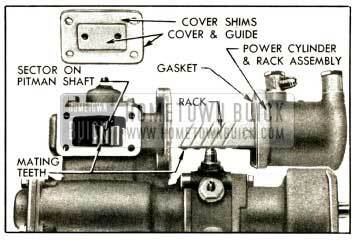 The hydraulic power mechanism added to the steering gear includes a power cylinder and rack connected to a separate gear sector on the steering gear pitman shaft, a hydraulic valve mounted concentric with the steering worm shaft and operated by the shaft, a high pressure oil pump driven by a belt from the engine, an oil reservoir, and connecting pipes and hoses. See figure 7-14. The hydraulic units are filled with the same oil as specified for Dynaflow transmissions. 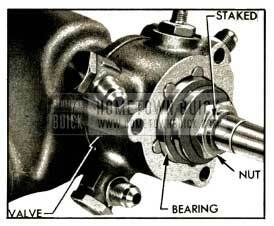 The 1952 Buick Power steering gear housing is filled with regular steering gear lubricant. 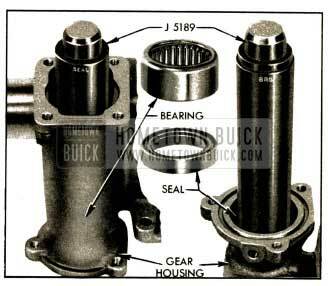 The 1952 Buick power steering gear assembly is the recirculating ball nut and worm type, having a ratio of 21.3 to 1. As shown in figure 7-15, the upper end of the pitman shaft is extended and provided with a separate gear sector which meshes with a power rack mounted in the gear housing. The power rack is pinned to the piston rod of the power cylinder, mounted on the rear side of gear housing, and is held in proper mesh with the pitman shaft sector by a guide attached to a shim adjusted housing cover (not shown). 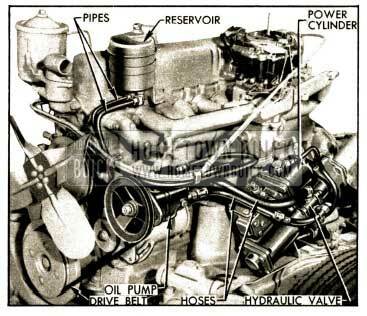 The 1952 Buick power cylinder is a double acting type since oil pressure may be applied to either side of the piston through external tubes connected to the hydraulic valve, described below (subpar. b). An adapter closes the inner end of the cylinder and provides a bearing for the piston rod. The two outer grooves in the circumference of the adapter contain „O“ ring rubber seals, and the bore is fitted with a spring loaded rubber seal to prevent escape of oil at piston rod. See figure 7-15. Normal seepage of oil through the bearing is bled back to the hydraulic valve through passages in adapter and cylinder connected to an external tube. The upper end of steering shaft is supported by a steel jacketed prelubricated bearing (bushing) mounted in signal switch housing. The lower (worm) end of shaft is supported in gear housing by two needle bearings. These bearings permit axial (endwise) movement of the shaft. Axial movement of the steering shaft is opposed by two flat thrust bearings in conjunction with centering springs and plungers contained in the hydraulic valve. One thrust bearing butts against a shoulder and the other bearing is retained by a threaded nut on the worm section of steering shaft. The inner races of both bearings contact the valve centering plungers which are under pressure of the centering springs. See figure 7-15. Axial movement of the steering shaft under load is limited to approximately .030″ either way from the neutral (no load) position by the clearance between the thrust bearings and the hydraulic valve housing. This axial movement is used to operate the hydraulic valve. The hydraulic valve controls the flow of oil from the pump to the proper side of the power cylinder piston when power assistance is required and cuts off this flow when power assistance is not required. It also regulates the effort at steering wheel within the normal range of four to nine pounds so that this effort is proportional to the force necessary to turn the front wheels, thereby providing the “feel” of steering previously mentioned. All parts are contained in the valve housing which is mounted on the 1952 Buick Power steering gear housing and is concentric with the steering worm shaft. The housing has one central annular groove connected to the oil pump and two outer annular grooves connected to the reservoir. A valve spool, having a very close sliding fit in valve housing, is mounted concentric with the worm shaft and between the worm thrust bearings so that it moves with these parts. The spool contains two annular grooves which control the flow of oil between the grooves and oil passages in valve housing. See figure 7-15. The housing contains five equally spaced pairs of centering plungers which are forced outward against the gear housing and the valve cover by a heavy coil spring located between the plungers. As previously explained, the worm thrust bearings contact the plungers so that axial movement of the worm shaft is opposed by the plungers and springs. The worm shaft and thrust bearings will move the spool endwise in the valve housing, permitting oil flow to the power cylinder, whenever the thrust load on the worm shaft is sufficient to overcome the preload of the centering springs. The resulting control of the power mechanism will be fully explained in paragraph 7-11. The check valve located in the hydraulic valve housing permits the oil displaced by the power cylinder piston to bypass the oil pump during manual operation whenever the oil pump is not operating. It also prevents oil from overflowing through the reservoir vent under the same conditions. The oil pump, which is mounted on the engine in position to be driven by a belt from the crankshaft balancer, converts some engine power into oil pressure which is used by the power cylinder and rack to rotate the pitman shaft. The Eaton rotor pump and the Vickers balanced vane pump are optionally used, to assure adequate supply for production and service. The Eaton pump houses a drive rotor meshed with a driven rotor which rotates on a different center. As these parts rotate the pockets formed between them increase and then decrease to propel the oil from entrance to exit ports of pump. See figure 7-16. The Vickers pump houses a slotted driving hub or rotor in which twelve vanes slide radially outward to contact the hardened and ground inside surface of a ring. As the shaft and rotor rotates, centrifugal force and fluid pressure against the inner ends cause the vanes to follow the cam contour of the ring, which is so shaped that two opposing pumping chambers are formed. In each pumping chamber, the increasing and decreasing pockets formed between the rotor, vanes, and ring propel the oil from the entrance to the exit ports of pump. See figure 7-16. Both optional pumps contain an overload relief valve which is set to open at 750 p.s.i. and a flow control valve which recirculates oil within the pump as required to regulate the output volume to approximately 1 1/2 gallons per minute at all operating speeds. The reservoir is mounted on the engine at a higher level than the pump. See figure 7-14. It contains a fine mesh screen of large area. The filler plug is vented and is provided with an oil level gauge rod. The reservoir provides a reserve supply of oil to assure complete filling of the hydraulic system and the vented filler plug permits escape of any air that may be introduced into the system during assembly of the various units. Two pipes provided with flexible hoses connect the reservoir to the oil pump. A pressure line hose and a return line hose connects the oil pump to the hydraulic valve. See figure 7-14. The pressure line hose is reduced in size at the valve end to provide a dampening effect on any turbulence in the oil stream. The same hoses are used with the Eaton and Vickers oil pump, but the small reservoir inlet pipe and hose assembly is different for each pump. 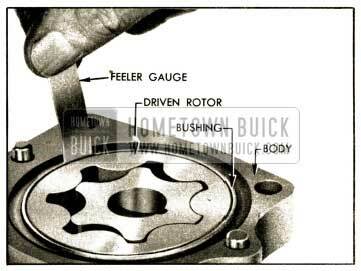 When the 1952 Buick steering wheel is turned, the ball nut must move axially along the worm shaft in order to rotate the pitman shaft and thereby turn the front wheels through the connecting linkage. Movement of the ball nut is opposed by the force necessary to turn the front wheels, consequently the worm shaft tends to move endwise through the ball nut. The ball nut and worm shaft act like a screw jack to thrust a load against one worm thrust bearing, tending to move the bearing. Movement of the thrust bearing (and worm shaft) is opposed by the centering plungers and springs in the hydraulic valve, therefore the thrust load must exceed the 300 pound total preload of the five centering springs before the worm shaft can actually move endwise. A pull of four pounds on the steering wheel rim produces a thrust load of 300 pounds, consequently the worm shaft will move endwise only when the force necessary to turn the front wheels requires an effort of more than four pounds at the steering wheel. Since movement of the hydraulic valve spool is controlled by the worm shaft and thrust bearings it remains in the neutral or centered position in valve housing whenever the effort applied to steering wheel is less than four pounds. 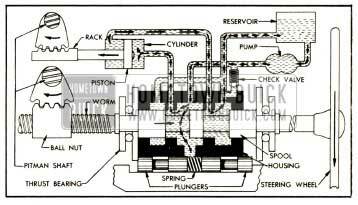 In this case the oil merely circulates from the pump through the valve and reservoir without having any effect on the steering operation. See figure 7-17. Although the power cylinder is filled with oil there is no interference with manual steering because the oil displaced by the piston can flow from one side of the piston to the other through the hydraulic valve. When the steering wheel is turned left with an effort greater than four pounds, the resulting thrust load compresses the centering springs and the worm shaft moves the spool upward in the valve housing. The spool then routes the oil flow from the pump into the upper end of the power cylinder. The passage to the lower end of power cylinder is left open for return of oil to the reservoir. See figure 7-18. Flow of oil into the power cylinder is resisted by the piston because of its connection to the pitman shaft. The oil pump then builds up just enough pressure to overcome this resistance so that just enough power is applied to rotate the pitman shaft. 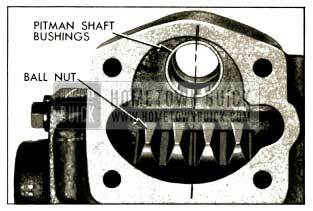 Since the pitman shaft is also geared to the ball nut on the worm shaft it is obvious that the pitman shaft cannot turn unless the steering wheel is also turned. 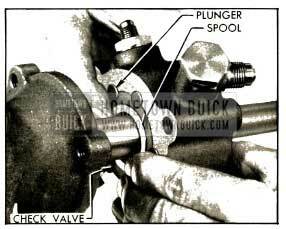 Thus, 1952 Buick power steering cannot be applied without manual steering. As the pump pressure builds up, oil pressure is also directed against the inner ends of the centering plungers. This pressure, added to the centering spring preload, tends to force the spool back to the neutral position. Since the pump pressure builds up in proportion to the force necessary to turn the front wheels, the corresponding pressure on the plungers creates a reaction that must be overcome by effort on the steering wheel. In this way, the effort required at the steering wheel is regulated in proportion to the resistance of the front wheels, giving the “feel” of steering previously mentioned. The effort on the steering wheel naturally drops to less than four pounds as the turn is completed; therefore the centering springs and plungers return the valve spool to the centered position, thereby cutting off application of oil pressure to the power cylinder. When the spool returns to the centered position, steering becomes entirely manual. The oil merely circulates through the hydraulic valve as shown in figure 7-17 and the oil pressure drops because there is virtually no resistance to oil flow. 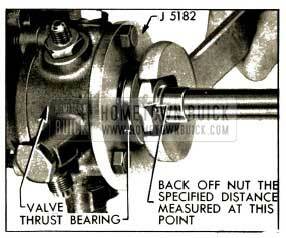 1952 Buick power steering on a right turn is accomplished in the manner described except that the worm thrust is in the opposite direction, therefore the valve spool moves down to route oil to the lower end of the power cylinder so that power will be applied to turn the pitman shaft in the opposite direction. When the front wheels strike an obstruction which kicks them to the left, the force is transmitted through the steering linkage and pitman shaft to exert a downward thrust on the ball nut and worm shaft; this is opposite to the direction of thrust when the steering wheel is turned left. If the thrust load exceeds 300 pounds, the valve spool will move down to route oil flow to the lower end of power cylinder, thereby applying opposing power to counteract the leftward movement of the front wheels. The opposite action occurs when the wheels are kicked to the right. In this manner, the power mechanism counteracts road shock before it is transmitted to the steering wheel. 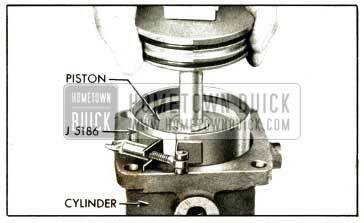 The check valve located in the hydraulic valve housing remains closed when the oil pump is operating. When the oil pump is not operating and the steering gear is operated manually, the oil displaced by the power cylinder piston flows through the check valve and back into the central groove of valve housing without passing through the reservoir and pump. The oil bypasses the pump which would obstruct its flow. This feature also prevents overflowing of oil through the reservoir vent. This paragraph will cover only those causes of trouble which may be due to the hydraulic power mechanism. Causes which are due to the mechanical components of the steering gear, linkage, and front suspension are the same as described for the standard steering gear in paragraph 7-3. Before assuming that the hydraulic power mechanism is at fault, make certain that the mechanical components are in proper condition. 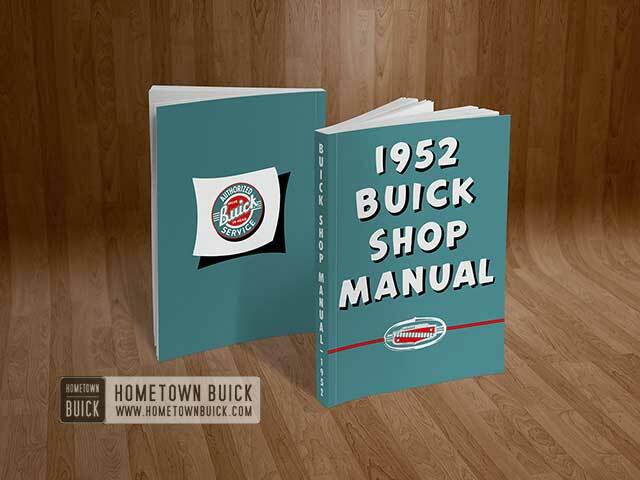 The mechanical items include: Front wheel alignment, tire condition and pressure, wheel bearing adjustment, lubrication and adjustment of steering linkage, and proper alignment of 1952 Buick Power steering gear in mountings to eliminate binding. Excessive lash between pitman shaft sectors and the ball nut or power rack (par. 7-13). Loose worm thrust bearing adjustment or sticking valve spool, requiring removal of gear assembly (par. 7-15). Air in hydraulic system, requiring bleeding (par. 7-13). Binding of steering shaft due to misalignment of gear in mountings. 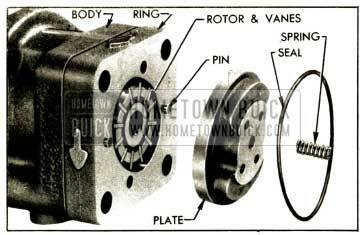 Sticking valve spool or faulty centering springs, requiring removal of gear assembly (par. 7-15). (1) Excessive lash between pitman shaft sectors and ball nut or power rack (par. 7-13). NOTE: A very slight rattle may occur on turns because of the increased lash off the “high point.” This is normal, and lash must not be reduced below specified limits to eliminate this slight rattle. NOTE: It is a normal condition to feel an increase in parking effort if the hydraulic oil temperature exceeds 170° F. The oil temperature may exceed 170° F after excessive turning or on very hot days. To determine whether hard steering actually exists, place car on clean dry floor, apply brakes, and with engine idling turn steering wheel from side to side to bring oil temperature to approximately 170° F. Apply Gauge J 5178 (15 lbs.) to a spoke at rim of steering and check the pull required to turn the wheel steadily, with gauge held at 90 degrees to the spoke. Pump drive belt loose. Adjust tension (par. 7-13). Low oil level in reservoir. Fill to proper level (par. 1-1). NOTE: If oil level is excessively low, check all hydraulic system lines and joints for evidence of external leakage of oil. Air in hydraulic system. Tighten valve cover bolts and all oil line connections on 1952 Buick Power steering gear, pump and reservoir, then bleed the hydraulic system (par. 7-13). Insufficient oil pressure. If the preceding suggestions do not reveal the cause of hard steering it will be necessary to make the following tests of oil pressure (subpar. f). Disconnect the pressure line hose at oil pump, attach Gauge J 5176 to pump and connect the hose to end of gauge where the valve is located. See figure 7-19. With engine idling at 450 RPM and gauge valve open, note the oil pressure on the gauge while turning steering wheel from one extreme position to the other. Especially note the maximum pressure which can be built up with the wheel held in either right or left extreme position. CAUTION: Do not hold wheel in extreme position for an extended period because it will drastically increase the oil temperature and will cause undue wear on the oil pump relief valve. With oil temperature between 150° F and 170°F, the maximum oil pressure should not be less than 700 p.s.i. for satisfactory power steering operation. If the maximum oil pressure is less than 700 p.s.i. it indicates trouble in the pump, or external oil lines, or steering gear, or a combination of these parts. To eliminate the lines and gear, close the gauge valve and quickly test pressure of the pump only, with engine idling at 450 RPM, then open the valve to avoid increasing oil temperature. First test (step 2) pressure low, and second test (step 4) pressure normal- indicates faulty external oil lines or steering gear (subpar. g or h). First test (step 2) and second test (step 4) pressures equally low -indicates faulty oil pump (subpar i). 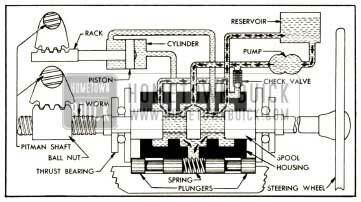 First test (step 2) pressure low, and second test (step 4) pressure higher but below normal indicates faulty pump and also faulty external oil lines or steering gear (subpar. g, h, i). Loose connections. Clean and tighten all connections and test for oil leakage. Leakage at hose unions or oil tube elbows. Remove leaking unions or elbows and install new „O“ ring seals. Leakage at worm shaft seal or cylinder piston rod seal, evidenced by an accumulation of hydraulic oil in gear housing. Leakage at valve cover seal, evidenced by oil dripping from top of valve cover. Remove gear assembly for replacement of seals (par. 7-15). Pressure loss in hydraulic valve or power cylinder. Remove gear assembly for disassembly and inspection (par. 7-15). Low oil level in reservoir. Fill to proper level (par. 1-1). Oil too light. Change to specified Dynaflow oil (par. 1-4). Loose pump assemb1y bolts. Tighten all pump bolts. Faulty internal pump condition such as dirt or sludge, sticking or scored relief or flow control valve, worn rotor parts, shaft oil seal leakages. Remove pump and disassemble for inspection (par. 7-16, Vickers; par. 7-17, Eaton). Air in hydraulic system. Tighten all external line connections and bleed hydraulic system (par. 7-13). Reservoir air vent plugged. Remove filler plug and clean vent. Drive belt too tight. Adjust tension (par. 7-13). Oil too heavy. Change to specified Dynaflow oil (par. 1-4). Sludge and dirt in pump. Remove pump and clean out (par. 7-16, Vickers; par. 7-17, Eaton). Bearings, shaft or other rotating parts worn. Remove pump and disassemble for inspection (par. 7-16, Vickers; par. 7-17, Eaton). 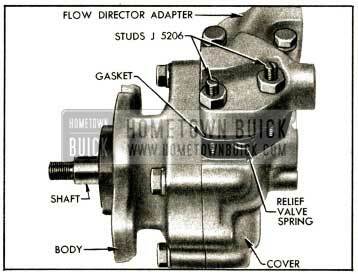 After a pump or 1952 Buick steering gear is installed, or a disconnected oil line is reconnected, all air that entered the hydraulic system must be bled out, otherwise noisy and unsatisfactory operation will result. 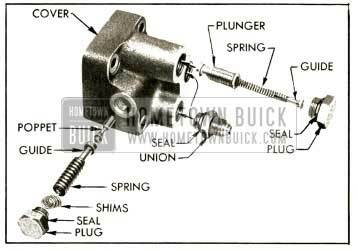 While some air will bleed out during operation of the 1952 Buick Power steering gear, this is not dependable; the following procedure must be performed to assure complete elimination of all air. After connecting all hoses and filling reservoir to proper level (par. 1-1), let the job set for five minutes with engine shut off. If a Vickers pump is installed, remove pipe plug from top of pump manifold and when oil starts to flow out of opening install plug just tight enough to stop oil .flow, then wait five minutes. Start engine and run it at approximately 1000 RPM for two or three minutes, then turn the steering wheel from one extreme to the other until all air is worked out, as evidenced by operation of the oil pump at a normal noise level. In some cases it may be necessary to repeat the setting, engine running, and steering operation to eliminate all air. Tighten the plug in Vickers pump manifold when bleeding operations are completed. Road test the car with some parking and some high speed driving if possible. The pump drive belt has proper tension when one side can be depressed%” with thumb pressure applied midway between the pulleys. To adjust belt, loosen pump mounting bolts and move pump horizontally as permitted by the slotted bolt holes in mounting bracket, then tighten bolts securely. Disconnect pitman arm from steering tie rod, and check tightness of pitman arm nut with an 18″ wrench. NOTE: N ever attempt to adjust steering gear lash with pitman arm connected to tie rod. 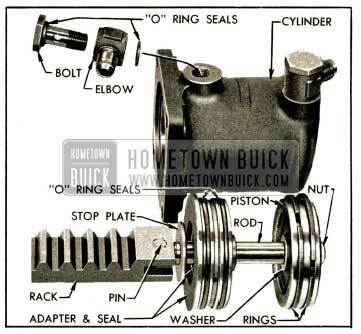 Turn steering wheel slowly through its full travel to check for binding, which would indicate misalignment of 1952 Buick Power steering gear in its mountings. Any binding due to misalignment must be corrected before adjustments can be properly made. Remove filler plug with vent attached (fig. 7-20) and use a clean oil gun to draw out approximately 3/4 pint of lubricant from the gear housing. Loosen the four corner bolts of power rack guide cover just enough to assure lash between the power rack and pitman shaft sector. See figure 7-20. NOTE: If bolts are loosened too much, the rack will bind on sector teeth. Turn steering wheel 2 3/4 turns from either extreme position to center the ball nut on the central “high point” of pitman shaft sector. At this point the center spoke of wheel should be straight down. Turn pitman shaft adjusting screw clockwise until lash between pitman shaft sector and ball nut is just removed, checking by working pitman arm, and tighten lock nut. See figure 7-20. Turn steering wheel two turns right or left from center. Apply Scale J 544-A to a spoke at rim of wheel and, while pulling scale at 90 degrees to the spoke check the pull required to turn the wheel steadily in the range where lash normally exists. See figure 7-7. Turn steering wheel back to near center and again use the scale to check the pull required to turn the wheel steadily through the “high point” or no-lash range. The pull through the “high point” (step 8) should be 1/2 to 3/4, pound greater than the pull in the lash range (step 7). Turn the lash adjusting screw as required to obtain this difference in pull after lock nut is securely tightened. Record the final scale reading. Remove the power rack guide cover (fig. 7-20), take out one .003″ cover shim, then reinstall cover with remaining shims and tighten bolts securely. Use scale to check the pull required to turn steering wheel steadily through the “high point” or no-lash range; this should be 1 to 1 1/4, pounds greater than the pull obtained in step 9. Change the total thickness of cover shims as required to obtain this difference. Shims are available in .003″ and .005″ thicknesses so that they may be combined to produce any required total thickness. When the pull obtained in step 11 is 1 to 1 1/4 pounds greater than the pull obtained in step 9, remove the guide cover and add one .003″ shim, then install cover and tighten bolts securely. Connect steering tie rod to pitman arm, turn tie rod plug up solid, ten back off two turns and install cotter pin. The worm thrust bearings cannot be properly adjusted with steering gear in car. If it is apparent that this adjustment is required, after making certain that both pitman shaft lash adjustments are correct, the steering gear must be removed so that the thrust bearings can be adjusted as described under Assembly of Steering Gear (par. 7-15, c). Remove pitman arm from pitman shaft, using Puller J 1025. See figure 7-11. Remove screws which attach front end of the left air intake duct to the fender skirt and coat rubber grommet on duct with Lubriplate to aid in pulling it through hole in skirt. Disconnect flexible hose at the clamp, reach inside hose and remove bolt that attaches rear end of air duct to rear fender skirt, then remove the air duct. Disconnect the pressure and return line hoses from the hydraulic pump and immediately install shipping caps on pump fittings to avoid draining the reservoir. Install shipping plugs in ends of hoses to retain the oil. After re-installing gear assembly in mountings, install steering wheel and turn it slowly from one extreme to the other to check for any binding. Readjust gear in mountings if any binding exists. The steering wheel and shaft must turn freely. Connect the pressure line hose (marked “PR” on pump end) to the union installed in pump port marked “PR”. On the Eaton pump this union is the one nearest engine but on the Vickers pump it is the one farthest from engine. Connect the return line hose (marked “RT” on pump end) to the remaining union on pump. This pump port is marked “RT”. After gear installation is completed fill the reservoir and gear housing to proper levels (par. 1-1), then bleed the hydraulic system (par. 7- 13, a). When removing the pump, use shipping plugs and caps to cover the hose connectors and unions on pump and plug open ends of the pressure and return line hose to avoid entrance of dirt. When installing the pump, adjust drive belt to proper tension (par. 7-13, b). Connect the two reservoir line hoses to pump, then fill reservoir to proper level (par. 1-1) and bleed the hydraulic system (par. 7-13, a). Thoroughly clean exterior of 1952 Buick power steering gear assembly, using care to avoid damaging the finish of the column jacket. 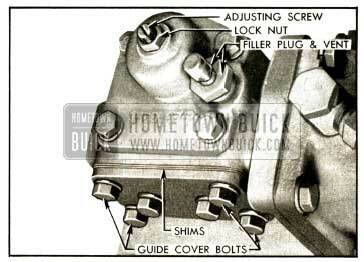 Remove four bolts which attach the column jacket to the hydraulic valve cover. Slide column jacket and inclosed transmission control shaft from the steering shaft, using care to avoid damaging the upper shaft bearing against the threaded end of shaft. Using hot soldering iron, disconnect the horn cable from the cable contact, then remove wire and contact from steering shaft. Remove two hoses, two large valve-to cylinder tubes, and the small bleed line tube, then allow oil to drain from hydraulic valve and power cylinder. Remove filler plug with vent and drain lubricant from gear housing. See figure 7-21. Turn steering shaft clockwise as far as possible, remove the four corner bolts only from the power rack guide cover, then remove the cover and guide assembly and all cover shims. See figure 7-21. Remove bolts and elbows from power cylinder, then remove power cylinder and rack assembly, and cylinder gasket, from gear housing. Push rack up to the cylinder adapter and then pull it sharply away to hammer the piston against the adapter. It may be necessary to repeat this several times to break the grip of rubber seals between adapter and cylinder so that the rack and piston can be removed. See figure 7-22. Remove safety nut, piston, thrust washers, adapter, and stop plate from piston rod. Turn steering shaft counterclockwise to move the ball nut to approximate center position, then remove the gear housing side cover and gasket with pitman shaft attached by the adjusting screw. See figure 7-23. Unscrew the adjusting screw to separate the pitman shaft from the side cover and remove adjusting screw and shim from the shaft. Remove hydraulic valve cover. Drive up edge of worm bearing ‘•nut where staked into worm shaft keyway, using suitable punch, then remove nut and thrust bearing. See figure 7-24. NOTE: Nuts on first jobs are locked with tangs of a lockwasher. With steering shaft horizontal, remove the hydraulic valve assembly, using care to keep the spool and plungers from falling out. Remove lower thrust bearing from gear housing. 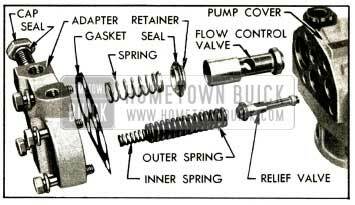 Check the valve spool and centering plungers for possible sticking in valve housing, then carefully remove these parts and the centering springs. Remove check valve and all unions and elbows. See figure 7-25. Place spool and plungers where they will not be damaged by contact with other parts. Remove gear housing end cover and gasket, then remove steering shaft and ball nut from gear housing. Remove clamps and ball return guides from ball nut, turn nut over to remove all balls (60), then remove ball nut from steering shaft worm. Thoroughly wash all parts in clean kerosene or other solvent and wipe dry with clean, lint-free cloths. Inspect steering shaft for wear or brinelling in ball and needle bearing races, which would require replacement of shaft; check shaft to make sure it is straight. Inspect teeth of ball nut and all sector teeth of pitman shaft. If teeth are excessively worn or scored replace the part. Replace pitman shaft if serrated end is twisted. Check fit of pitman shaft adjusting screw and shim in the slot in end of pitman shaft. With shim in place, screw head must be free to turn in slot with no perceptible end play to .002″ loose. If end play is excessive, selectively fit a new shim; these are furnished in four different thicknesses. 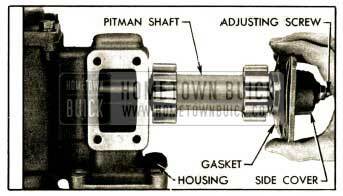 Inspect pitman shaft bushings in gear housing and side cover. 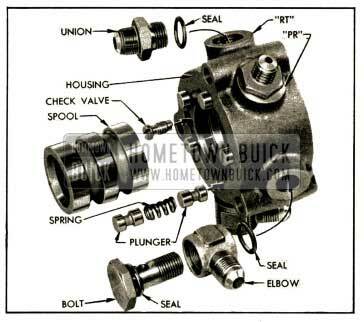 Replace bushings in housing and replace cover assembly if bushings are worn .excessively. Remove worm seal from gear housing with a punch and use Installer J 5189 to install a new seal with spring side outward. See figure 7-26. If worm bearing in housing requires replacement, drive it out with a punch and use Installer J 5189 to install the new bearing. See figure 7-26. If worm bearing in the housing end cover requires replacement, insert Remover J 5190 into bearing and turn the screw, which will expand two plates under the bearing and will then force the tool and bearing out. See figure 7-27. Use Installer J 5191 to install the new bearing. This tool has a shoulder to locate the bearing at proper depth in cover. See figure 7-28. Replace pitman shaft seal, installing new seal with feather edge toward inside of gear housing. Inspect oil shedder and control shaft bearing in gear housing. If bearing is of doubtful condition replace it. Inspect piston rod, teeth and guide bearing surface of power rack, and rack guide for excessive wear or scoring. If necessary to replace piston rod or rack drive out the coupling pin and use new pin to connect new parts. Stake rack at three places on each side to retain the pin, and file down burrs raised by staking. Inspect power cylinder bore for scores or other damage. Inspect piston rings for scores or breaks. Inspect seal in power cylinder adapter. If seal is worn or damaged, replace adapter assembly; the seal is not furnished separately for service. Inspect valve housing, spool, and centering plungers for scores, nicks, or burred edges. Replace damaged parts and make sure that spool and plungers slide freely in housing. Test the check valve by blowing through both ends. Ball should seat when blowing through small end, and allow passage of air when blowing through slotted end of valve body. 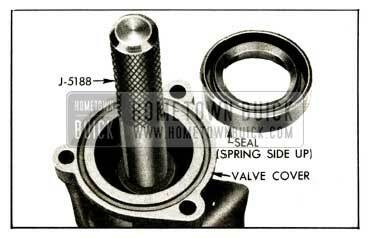 Remove seal from valve cover with a punch and use Installer J 5188 to install a new seal, with the spring side of seal outward toward the shoulder of tool. See figure 7-29. Inspect steering shaft bearing in signal switch housing. Replace bearing if worn or damaged, using care to press new bearing squarely into housing to avoid distortion. Inspect steering column jacket for distortion. A rippled or wavy feeling of jacket surface, particularly at lower end, will usually indicate a sprung jacket. Replace jacket if sprung or othe1 wise damaged. NOTE: Make sure that all parts are absolutely clean, and lubricate parts with clean engine oil during assembly. 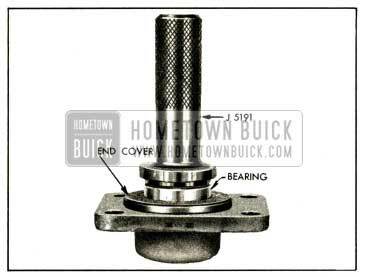 Place 1952 Buick power steering shaft on bench with upper end to your right, then install ball nut on worm so that when teeth are uppermost the deeper side of teeth are toward you. Install 30 balls in each circuit of the worm, nut, and return guides, and install guide clamp. Run ball nut to the upper end of worm, then install steering shaft in gear housing, using care to avoid damaging worm seal in housing. Install end cover with new gasket. Install lower thrust bearing over steering worm with the large race outward, and place a new „O“ ring seal in groove in face of gear housing. Install check valve in valve housing and tighten securely. Install valve spool. Install centering springs, then install all plungers with narrow lands outward. See figure 7-25. NOTE: The spool and plungers are a close fit in housing and must be started carefully to avoid jamming. Do not force these parts into place. Install hose unions with new „O“ ring seals, placing union with smaller outer threads in valve housing port marked “PR” and other union in part marked “RT”. Install elbows and bolts at the other ports with new seals on both sides of each elbow. Do not tighten these parts. With steering shaft horizontal, install valve assembly with check valve toward gear housing, using care to keep parts from sliding out of housing. See figure 7-30. Support 1952 Buick Power steering gear in a vertical position, move valve housing around to make sure that thrust bearing balls are seated in races, then align the large (RT) union with left edge of cylinder flange on gear housing. Install Valve Cover Adapter J 5182 with valve cover bolts (fig. 7-31), center the valve spool around worm shaft and tighten bolts securely. Install upper thrust bearing with large race toward hydraulic valve, make sure that balls are seated in races, and install a new worm bearing nut. Install steering wheel and turn counterclockwise until centering springs are fully compressed, due to pressure of ball nut against the end cover. Hold wheel and tighten worm bearing nut just enough to seat the thrust bearings against valve spool, then back off nut 1/16″ to 3/32″ measured at corner of nut hex. See figure 7-31. Stake outer edge of worm bearing nut down into keyway of worm shaft (fig. 7-24), making sure that nut does not turn from its adjusted position. The thrust bearing adjustment procedure seats the thrust bearings against all centering plungers but leaves approximately .001″ clearance between bearings and spool to avoid the possibility of binding the spool in valve housing. Remove cover adapter and place Protector J 5159 over threaded end of steering shaft. Place a new „O“ ring seal in groove of valve cover and install cover. With open side of cover facing right side of 1952 Buick Power steering gear install cover bolts and lockwashers and tighten securely. Place adjusting screw and shim in slot of pitman shaft, install side cover with a new gasket, and install lock nut finger tight on screw. Place gear assembly on left side, turn steering shaft until ball nut teeth are centered on pitman shaft bushings, and tilt nut slightly toward side cover opening. See figure 7-32. Hold pitman shaft with the gear sectors straight down as it is installed in gear housing; use care to avoid damaging pitman shaft seal in gear housing as shaft is pushed through it. Install side cover and tighten bolts securely. Install steering wheel and turn slowly through full range (5 1/2 turns) to check for free action, then turn wheel back to midway position (2 3/4 turns) to center the ball nut on the central “high point” of pitman shaft sector. Turn pitman shaft adjusting screw clockwise until lash between ball nut and pitman shaft sector is just removed and tighten lock nut. Turn steering wheel two turns right or left from center. Apply Scale J 544-A to a spoke at rim of wheel and, while pulling scale at 90 degrees to the spoke, check the pull required to turn the wheel steadily in the range where lash normally exists. See figure 7-7. The pull through the ”high point” (step 16) should be 1/2 to 3/4 pounds greater than the pull in the lash range (step 15). 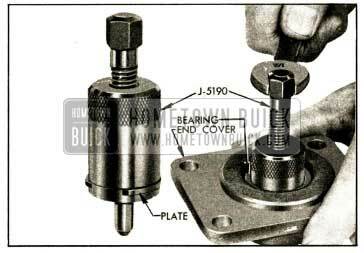 Turn adjusting screw as required to obtain this difference in pull after lock nut is securely tightened. Record the final scale reading for use later. Install new „O“ ring seals in both grooves of power cylinder adapter. Place stop plate on piston rod, then install Rod Inserter J 5193 to protect the seal as rod is pushed through seal and adapter. See figure 7-33. Install thrust washer, piston with rings, thrust washer, and safety nut on piston rod and tighten securely. Use Ring Compressor J 5186 to compress the piston rings, then install piston and adapter in power cylinder. See figure 7-34. It may be necessary to tap the end of power rack with a soft mallet to push rings through the compressor and into cylinder. Tap the adapter down flush with cylinder flange. Install the two elbows and bolts on power cylinder, placing new „O“ ring seals on each side of each elbow. Do not tighten bolts. Turn steering shaft clockwise to limit of travel. Push power rack in against stop plate in cylinder adapter. Install power cylinder and rack assembly on gear housing with a new gasket. The end tooth of rack must mesh between the two end teeth in pitman shaft sector. See figure 7-35. Install power rack guide and cover assembly with all of the original shims except one .003″ shim, and tighten cover bolts securely. Use Scale J 544-A to check the pull required to turn steering wheel steadily through the “high-point” or no-lash range; this should be 1 to 1 1/4 pounds greater than the pull previously obtained in step 17. Change the total thickness of cover shims as required to obtain this difference, then add one .003″ shim and tighten cover bolts securely. Install the small bleed line tube and the two large valve-to-cylinder tubes. The longer tube goes on left side of gear assembly. See figure 7-21. Tighten the elbow bolts at hydraulic valve but leave elbow bolts loose at power cylinder. 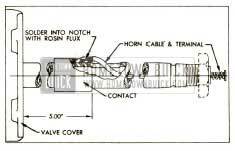 Install the horn cable contact on steering shaft with notch for cable aligned with hole in shaft and outer edge of contact located 5″ from face of valve cover. See figure 7-36. Install horn cable and terminal assembly in steering shaft and solder the cable end into notch of cable contact, using soldering iron and rosin flux. Make sure that contact surface is free of flux and solder. Place Bearing Protector J 5159 over the end of steering shaft. See figure 7-37. Install steering column jacket and transmission control shaft assembly, using care to avoid damaging the fabric control shaft bearing in the valve cover. Remove unions from the hydraulic valve and fill valve as completely as possible with oil specified for Dynaflow transmissions (par. 1-4), then install and tighten unions. Attach the pressure and return line hoses, fill them with oil and install plugs in open ends. Remove both elbow bolts from power cylinder and fill the cylinder and tubes with Dynaflow oil, then install and tighten the elbow bolts securely. 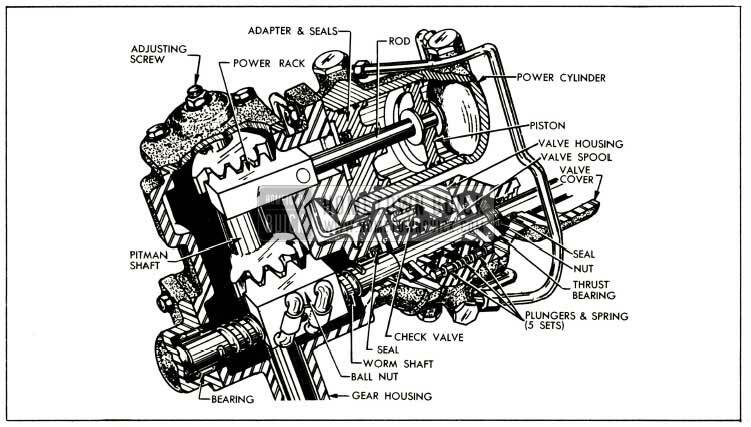 NOTE: It is desirable to fill the valve, tubes, and cylinder as completely as possible to exclude air which would have to be bled out after gear assembly is installed in car. Rapping the value and cylinder with a soft mallet during the filling operation will aid in eliminating air pockets. Fill the gear housing to filler opening with Multi-Purpose Gear Lubricant specified for synchromesh transmissions (par. 1-1) and install filler plug with vent. With all inlet and outlet ports plugged and capped to avoid entrance of dirt, thoroughly clean exterior of pump. Remove manifold and two gaskets, using 3/16″ hex (Allen) wrench (fig. 7-38), then remove bolts and separate the cover from pump body. Remove plug and seal from rear end of pump cover and remove spring guide, spring, and flow control valve plunger from cover. See figure 7-39. Remove plug and seal from side of pump cover and remove shims, spring, spring guide, and relief valve poppet from cover. See figure 7-39. Be careful not to lose any of the shims. Remove pressure plate spring and „O“ ring seal, then remove the pressure plate which fits over two dowel pins extending through the ring. Remove the ring from dowel pins, then remove „O“ ring seal and the rotor with vanes. See figure 7-40. Remove bearing retaining ring, using Ring Compressor J 5207 (fig. 7-44), then press drive shaft and outer bearing out of pump body. Shaft must be pressed through the inner ball bearing which is kept in the body by the shaft seal. Remove bearing spacer. See figure 7-41. 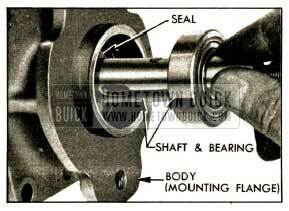 Drive shaft seal from body with a punch and remove the inner ball bearing. Wipe the bearing and shaft assembly with clean cloths; do not soak in cleaning solvent as the lubricant sealed into the bearing may be diluted by solvent. Wash all other parts in clean kerosene or other solvent and wipe dry with clean lint free cloths. Inspect the drive shaft for wear and check both ball bearings for roughness or noisy operation. If the large bearing must be replaced, press the new bearing on shaft with a tool that applies pressure on the inner race only. Check fit of vanes in slots of rotor; vanes must slide freely but snugly in slots. Tightness may be relieved by thorough cleaning or removal of irregularities. Replace rotor if excessive looseness exists between rotor and vanes, and replace vanes if they are irregularly worn or scored. Inspect all ground surfaces of the ring for roughness or irregular wear. Slight irregularities may be removed with a hard Arkansas stone. Replace ring if inside cam surface is scored or worn. Inspect the flat faces of the pressure plate and body for wear or scoring. These faces may be repaired by lapping until smooth and flat, after which all lapping compounds must be thoroughly washed away. Inspect ground surfaces of the relief valve poppet and flow control valve plunger, paying particular attention to seating surfaces. Slight irregularities may be corrected by lapping or polishing. Inspect all passages in cover and body for obstructions or dirt. Make sure that all parts are absolutely clean, and lubricate all moving parts with clean engine oil during assembly. Use new seals and gaskets. Make certain that the bearings and shaft seal are firmly seated in their proper positions. After the inner ball bearing is installed, the shaft seal must be installed with the two 1/16″ holes in casing toward the outside. Use a tube or shaft 1 3/4″ in diameter to apply pressure against outer edge of seal during installation. 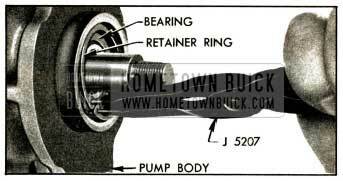 The ring must be installed over the dowel pins with the embossed arrows pointing in a counterclockwise direction as viewed from rear end of pump. See figure 7-40. NOTE: When viewed from the front or shaft end of pump, the arrows on ring point in a clockwise direction, which is the direction of rotation of pump shaft. Install vanes in slots of rotor with the rounded edge outward toward the ring. Before installing cover make sure that the pressure plate spring is located in the recess in pressure plate. Turn cover bolts down snug only, then install the manifold with gaskets before tightening the cover bolts securely. This is necessary to assure proper alignment of the cover, manifold, and body. Install relief valve spring with all original shims and tighten relief valve plug securely. If plug is not firmly seated the relief valve setting will be affected. When assembly is completed, rotate pump shaft to make sure of free movement, then plug or cap all hose connections to exclude dirt until pump is installed. Install Gauge J 5176 and check pump pressure as described in paragraph 7-12 (f). Relief valve should start to open, as indicated by a slight buzzing noise in pump, at 700 p.s.i. or slightly higher. With engine speed increased above idle, the maximum pump pressure should not exceed 900 p.s.i. Change the number of relief valve shims as required to obtain operation specified in (b). Remove large hex cap and seal from the flow director adapter (fig. 7-42) but leave hose connector in place. Remove hose unions and seals from pump cover. 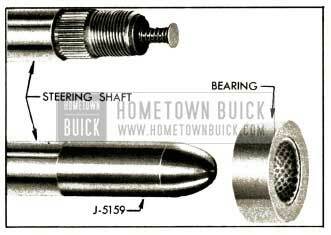 Remove adapter bolts and install Studs J 5206, one at a time, at the two locations shown in figure 7-42. Loosen the stud nuts and two remaining adapter bolts evenly to relieve the pressure of springs located under adapter. If adapter does not separate from pump cover as bolts and nuts are loosened, rap with a soft mallet to loosen it. Remove adapter, gasket and studs. Remove the three springs from pump cover, then remove the „O“ ring seal and tubular retainer from the larger hole. Turn pump over to allow the relief and flow control valves to slide out of pump cover. See figure 7-43. Place valves where they will not be damaged by contact with other parts. Remove cover bolts, then use a soft mallet to tap cover loose from the locating dowels in pump body. Remove the rubber seal, rotors, and drive pin from pump body. Use Compressor J 5207 to remove the shaft bearing retainer ring (fig. 7-44) then press against the inner end of pump shaft to remove shaft and bearing from pump body. Wipe the bearing and shaft with clean cloths; do not soak in cleaning solvent as the lubricant sealed into the bearing may be diluted by solvent. Wash all other pump parts in clean kerosene or other solvent and wipe dry with clean lint free cloths. Check pump cover and body for wear caused by the rotors. Replace either part if surface is scored or appreciably worn. Replace bearing in cover if worn or noisy. Inspect the drive and driven rotors; if noticeably worn or scored replace both parts, which are furnished in matched sets. 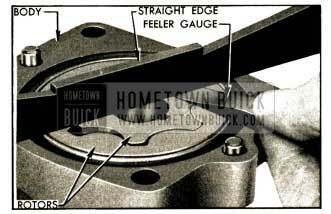 If these parts appear satisfactory, check the clearance between the rotors at all points with feeler gauges. See figure 7-45. Replace rotors if clearance exceeds .006″. 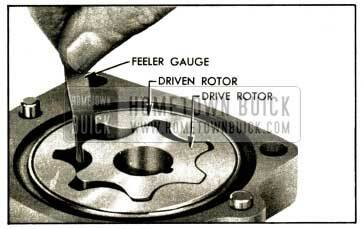 Using straight edge and feeler gauges, check side clearance of rotors in pump body. See figure 7-46. If side clearance exceeds .0025″ replace pump body. 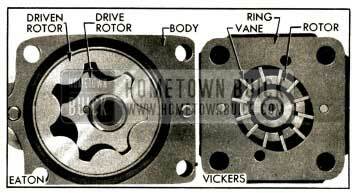 Check clearance between driven rotor and bushing in pump body. See figure 7-47. Replace the body if clearance exceeds .006″. Inspect pump shaft seal in pump body. If worn, damaged, or of doubtful condition, remove old seal with a punch. Install new seal with spring loaded edge inward, pressing seal squarely into place with a suitable tool to avoid distortion of seal casing. Inspect pump shaft for wear and check bearing for roughness or noisy operation. If either part required replacement use an arbor press to disassemble and assemble these parts to avoid damaging the bearing. Carefully inspect the relief and flow control valves for nicks, scores or deep scratches; also inspect their bores in pump cover. Minor nicks may be removed with a hard Arkansas stone, but the parts should be replaced if otherwise damaged. The valves must be free in their bores with a maximum clearance of .0025″. Replace flow control and relief valve springs if they are distorted or of doubtful strength. Install shaft and bearing as an assembly, and press against outer race to seat bearing in body. See figure 7-48. Use a new adapter gasket and new rubber seals at all points. When assembly is completed, rotate pump shaft to make sure of free movement, then plug or cap all unions and connectors to exclude dirt until pump is installed.